Rocky Mount, NC, now has a FastMed Urgent Care clinic that is open 365 days for your convenience. The new location is open on Sunset Avenue. FastMed provides quick healthcare at a low cost. We offer extended hours, so you can come in to get the treatment you need for your immediate healthcare concerns. Our Rocky Mount, NC, location offers urgent care services, and we’re even open on weekends. Walk right in to FastMed between 8:00 am and 4:00 pm on Saturday or Sunday, no appointment necessary. FastMed Urgent Care also offers professional medical care during the week from 8:00 am to 8:00 pm, and on holidays from 9:00 am to 4:00 pm. FastMed Urgent Care allows you to get the healthcare you need, when you need it– no appointment necessary. Walk in to our new location in Rocky Mount, NC, which offers urgent care on weekends. Our compassionate medical professionals can help you with most of your healthcare needs, avoiding waiting at the ER. Even if you need care on the weekend, our goal is to get you in and out within an hour, so we won’t take up your valuable weekend time. If you want to speed up the process even more, you can check-in online with our ZipPass service. While this is not an appointment, the FastMed ZipPass system displays the next available check-in time, which is usually when our patient volume is low. By checking in through ZipPass, you may shorten your wait time even more. FastMed Urgent Care accepts most major insurance plans, so we can provide you with low-cost treatment. If you have a non-life-threatening healthcare concern, FastMed Urgent Care is more cost-effective than a trip to the emergency room, which is typically 7 times the cost of a FastMed visit. 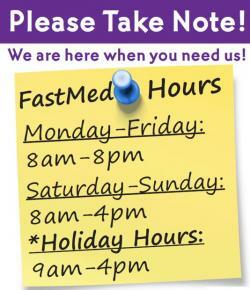 If you’re looking for fast care at a convenient time, FastMed provides urgent care open on weekends. Whether you are trying to fit a routine physical into your busy schedule, or an illness or injury strikes you on a weekend, FastMed can cater to your healthcare needs at the most convenient time for you.